Monkeyland – is the world’s first free roaming multi-specie primate sanctuary. Monkeyland has as one of its aims, to create awareness about the plight of primates and to show that with a greater understanding of our primate cousins, that we can all live in harmony. Birds of Eden – Birds of Eden is the Garden Route’s very own world-class free flight bird sanctuary. Birds of Eden’s unique two hectare dome (the World’s largest) spans over a gorge of indigenous forest. Completely natural! Tenikwa Wildlife Awareness Centre – Tenikwa today it is one of the largest active wildlife rehabilitation centres in the Western Cape, attending to a diverse variety of animals accepting both terrestrial and marine species. Great activity for children! 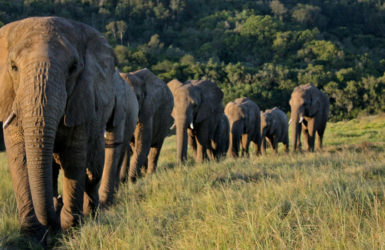 Jukani Wildlife Sanctuary – On tour you are guided through the sanctuary by one of our highly skilled and very motivated guides who will not only give you an insight into all the animals at Jukani Wildlife Sanctuary, but enable you to gain a better understanding of these creatures in the wild. Plettenberg Bay Game Reserve – Join experienced and knowledgeable game rangers for a two-hour game drive in an open Land Rover so you can feel close to Nature and enjoy the sensory experience of Africa. Radical Raptors – strives to provide on-site facilities for the treatment of injured birds of prey and suitable secure housing for birds undergoing treatment. Proven falconry techniques are used throughout the rehabilitation process. Daily flying displays! Lawnwood Snake Sanctuary – The sanctuary offers hourly informative, interactive tours for any ages with over 100 snakes and other reptiles to see. Open daily 9am – 5pm. We cater for the snake phobic to the snake lover! Knysna Elephant Park – The Knysna Elephant Park (est. 1994) was the first facility in South Africa to house and care for orphaned African elephants. These animals include relocated animals, orphaned calves, elephants rescued from culls and ex-circus animals. Tsitsikama Wolf Sanctuary – The Sanctuary tries to provide the wolves with an environment as close to their natural habitat as is possible in the South African Climate. It is actually too hot for wolves here but as they are highly adaptable animals they do especially well in the cooler areas of our country. Garden Route Wolf Sanctuary – The sanctuary is situated south of the N2 between Knysna and Plettenberg Bay. The interactive guided tours that take you through the wolf enclosures is a truly unique experience and allows you to get really close and personal with them.